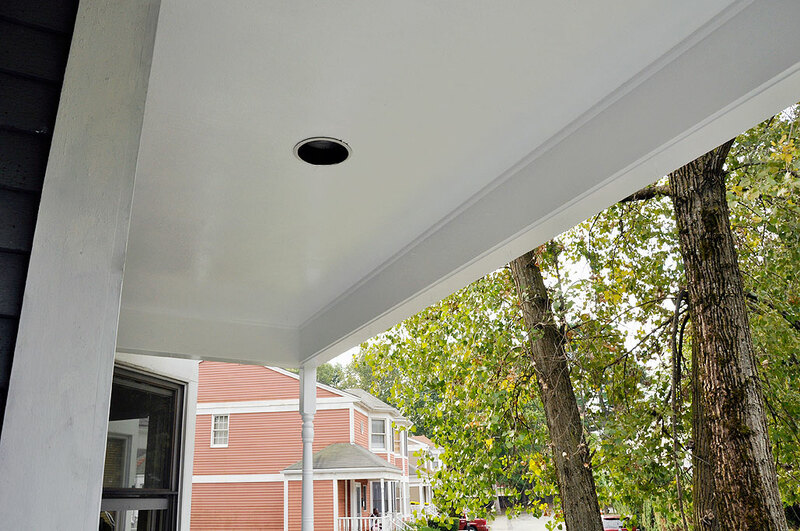 While some of us were busy cleaning up the garden, others were busy putting the finishing touches on the front porch. The weather was mostly cooperative. Saturday got a bit warm (high 80’s), but that was helpful because everything dried really quickly. We managed to get two coats on the porch floor before the day was through. We did all of the painting with just brushes (two 4″ brushes, one 2″ brush, one 1″ brush). At first we thought it would be slow, but it was actually a lot quicker than expected. 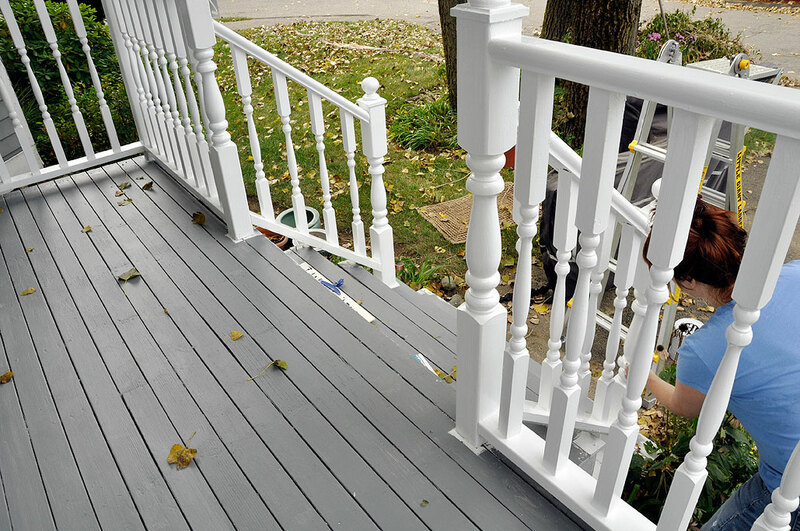 Rollers are great for flat walls and ceiling, but a brush is much better for surfaces with gaps (decks) and irregular shapes (railing spindles). They give better control and splash less compared to rollers. A high quality paint brush, if properly taken care of, can last for a long time. Putting the first and second coat of paint on the ceiling and floor did not take much time. What consumed the entire weekend was the surprising amount of detail work: painting the spindles, edging between the white of the trim and the gray of the deck, etc. We wish there was a faster way to paint the spindles, but sometimes doing it manually IS the fastest way. We got everything completed by Sunday afternoon, which was fortunate for us as the dry weather came to an end on Monday. 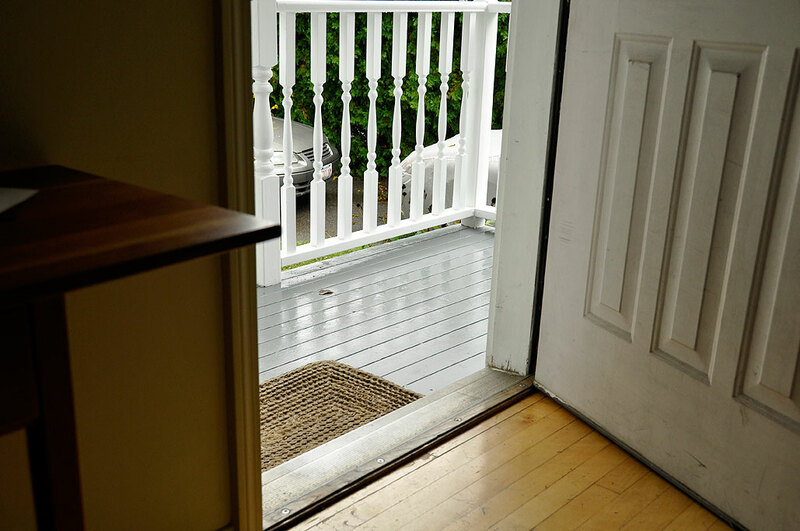 We had meant to hose down the deck, but the heavy rain saved us the trouble by giving everything a nice wash.
Now that the entryway is presentable again, the next renovation project will be to deal with the front door. We’ll need to paint it, replace the worn weather-stripping, and perhaps do as a few readers have suggested and install a keyless biometric lock to make it easier for the folks who are constantly coming and going. Apparently, there are still a few RainyDayRenovation projects on the queue before we can settle in for Winter.